RINGO STARR & HIS ALL STARR BAND: Absolutely incredible! 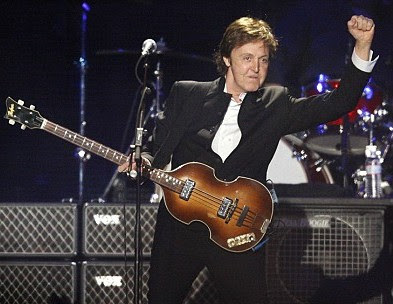 As a lifelong Beatles fan, one the greatest moments possible, occurred last night at Radio City Music Hall. Paul McCartney joined Ringo Starr on stage for a surprise encore, performing the Beatles classic "Birthday" in honor of Ringo’s 70th. There was a buzz all night long throughout Radio City about all the famous people who were at the show. As we arrived, Elyse we nt over to the crowd gathered at the back stage entrance to see who was around. There I saw my pals Eddie from X Session & Rob Leonard from 90.3 FM. They told us they saw Yoko Ono, Olivia Harrison, Jeff Lynne & Joe Walsh all entering the building. As Pie arrived, me, Elyse, & Darren Devivo of WFUV made our way inside. As we walked into the lobby, I order a beer, and comedian Richard Lewis goes by & then Joe Walsh. As we got to our seats we were greeted by 104.3 FM's Ken Dashow, sitting behind us. You could feel the special aura around the room as the show began, this was going to be a special night. 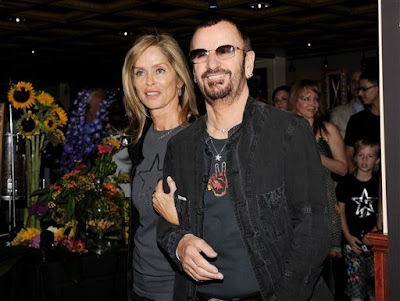 Ringo began celebrating his 70th birthday with a global wish for Peace & Love at a gala celebration in Times Square at the Hard Rock Cafe. He was surrounded by his wife Barbara Bach, family & friends. He told everyone to spread the message of Peace & Love in hope to make the world a better place. Tonight he celebrated with a concert at Radio City Music Hall. It was the 11th All Starr Band lineup, that Ringo has organized since 1989. How it works is, he takes center stage singing some of his Beatles & solo classics. Then he hops on the drums, & he lets his guest musicians (the All Stars) take the spotlight for a couple of songs. This year’s Tour may not have sounded like the strongest All Starr Band lineup but they put on a hell of a show. The band included: Edgar Winter, Rick Derringer, Gary Wright, Wally Palmar (the Romantics), Richard Page (Mister Mister) & playing alongside Ringo on drums, second time All Starr; Greg Bissonette. Bissonette has played with Santana, David Lee Roth, Joe Satriani, Spinal Tap, Toto, and in movies & on television. 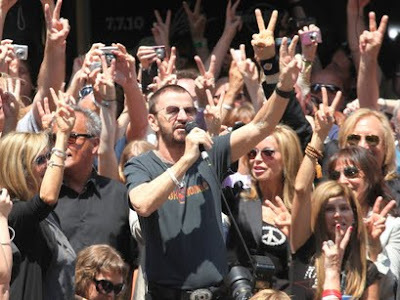 Ringo gave you most of his usual classics, adding a couple of newer songs from his latest album. He appeared as pleasant & good natured as always. One of his funniest moments came when he introduced "Boys" “this is a song I did with that other band I was in”, as the crowd cheered he said “Rory Storm & the Hurricanes"(his band prior to the Beatles). He said “well, first I did it with Rory then with that other band I was in”. Of course we got the legendary "Whats My Name?" as the crowd roared "RINGO!!" Edgar Winter put on a great display of his multi talented, instrument playing, jumping from keyboards, to sax, to percsussion, while rocking the Hall with his classic "Frankenstein". Rick Derringer put on a rock guitar extravaganza with his "Rock & Roll Hoochie Koo" & some great guitar solo’s. As a young teen I loved the late 70’s New Wave scene & seeing Wally Plamar do the Romantics classics was just great. He rocked the house with the classic “What I Like About You". Gary Wright also did a fantastic job with "Dream Weaver" & "Love Is Alive" as he recalled his early days playing with Ringo on George Harrison's "All Things Must Pass" album. 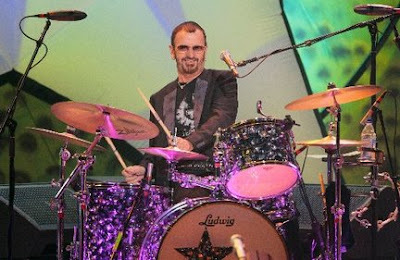 For "Photograph" the band was joined on drums, by Ringo’s son Zak. Also joining in was former All Starr sax player, Brooklyn's own Mark Rivera. As the final song "A Little Help From My Friends" was played the stage was stormed by all the rock stars. Yoko Ono, Little Steven (E Street Band), Jeff Lynne (ELO), Brian Johnson (AC/DC,) Mick Jones (Foreigner), Max Weinberg (E Street Band), Dave Stewart, Peter Asher, Jim Kelter, plus former members of Ringo’s All Star Band: Joe Walsh (Eagles) Greg Lake (ELP), Nils Lofgren (E Street Band), Colin Hay (Men at Work), & Gary Brooker (Procol Harem). Yoko Ono wearing a black hat & sun glasses, sang along side Ringo on A Little Help From My Friends. At one point it seemed Ringo mimicked her screeching when she seemed to ask for a mic to be turned on. In any event, she seemed to be having a great time, finishing out the song dancing with Little Steven Van Zant. A cake in the shape of a drum kit was wheeled out on stage, by a few of Ringo's grandkids and all of Radio City sang Happy Birthday. 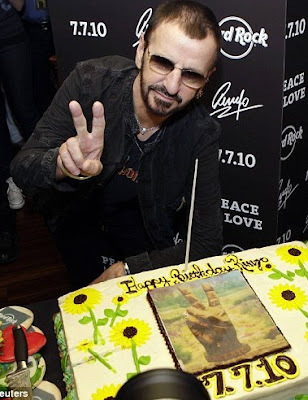 Ringo had no knife and stuck his drum stick in the cake. He said good night, almost like he was in a rush “that’s it, thank you”. He walked off stage & in classic Ringo humor was heard singing "Happy Birthday to me..."
But the house lights did not go on and you knew something else was going to happen. As I looked with my binoculars I saw a wonderful sight, a roadie tuning a Hofner bass. Could it be? I announced it to everyone around me & we all got a bit more excited? 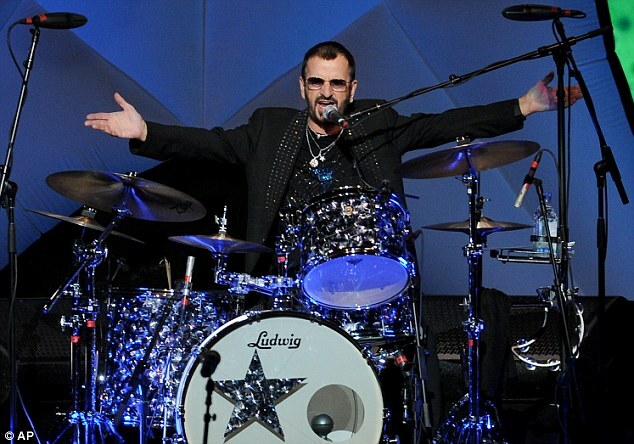 After the song ended, Ringo jumped down off the kit & the two embraced in a very emotional moment for all. Ringo said "What a surprise, How great is that?" The crowd was now gone, completley estatic. 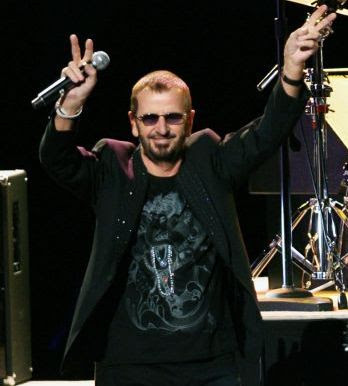 Ringo closed with "I love you man, peace & love- thank you". The closest thing we could have to a Beatles reunion, Paul & Ringo onstage, Yoko & Olivia Harrison in the audience. In all the hundreds of concerts I have been to, my binoculars have seen a lot. But tonight they saw an unprecedented moment, two Beatles, in it's little circle. Paul on bass & Ringo behind him on drums. What a sight!! We all took a deep breathe as one of the best rock & roll moments happened before our eyes, live in person. It's hard to imagine Ringo is 70, it makes us all wonder how old we have gotten. So many years of his great music, and the music continues. Tonight was spectacular. Happy Birthday Ringo, & thank you for what you’ve given us! What a show, I didn't think it would be nearly that exciting, but they really rocked the house! I had an argumrnt with a really nasty guy next to me, as soon as Ringo said goodnight, this creepy guy hurried out, missing the entire Paul McCartney performance! Karma. George would be psyched! Peace and Love! I too was at the concert with my wife and two friends. What can I say, the show was fun, the band was talented, and Ringo is a great human. He looks about 40 years old not 70. The joining on stage of about 20+ musicians for "little help from my Friends" and Give Peace a Chance" was touching...it must have meant so many personal things to everyone in addendence. Then the encore with Paul coming out for the most amazing few minutes, effectively a Beatles Reunion for one song, "Birthday"
How lucky we are to have that. This was the most amazing show I've ever seen. To see Ringo and the All Starr band, and hear all of their hits was fantastic, but to get to see Sir Paul too was just beyond words. I'm 57 years old and I screamed like a teenybopper at a Justin Bieber concert. Ken Dashow just talked about Paul's appearance last night and according to Dreamweaver Gary Wright, Ringo had no idea Paul was going to be there. It was a surprise orchestrated by his wife Barbara. Well done. I read that Paul watched part of the show from the last row in the orchestra! He was right near us! Ringo didn't know he was there.